Last fall I made a couple of changes to the Voice On The Web infrastructure, including adoption of responsive design to automatically adjust its display format across all PC, smartphone and tablet platforms. At the time I felt this was sufficient to meet viewer needs and I did not need to look into building device specific applications. Back in January when the BlackBerry Developer Relations team was holding one of its weekend Port-a-thons I decided to try out the BlackBerry App Generator simply to experience the process for launching an app, without the need to understand any programming language or tools. It appeared to be fairly simple and straightforward. Clicking on the “Create Your App” button I was taken through the process in only a few steps that basically involved entering a link to Voice On The Web, incorporating a logo and creating a few representative screenshots. The entire process required 10 to 15 minutes. As a final step you must also register as a Vendor and select what you want to charge for your App; “Free” is one option. 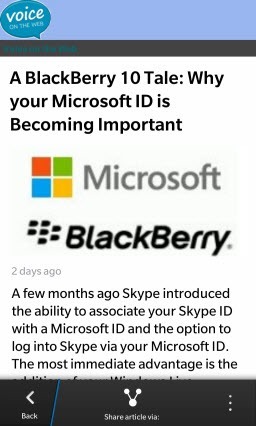 BlackBerry also requests some form of verification of your business, either via business registration documents or other appropriate means; finally, if you charge for your app, they need any relevant tax registration, such as VAT in Europe or HST/GST in Canada. Once approved as a vendor you have access to the Vendor portal where you can track and modify your apps as appropriate. In my case I had to wait a couple of weeks for final approval due to the huge number of apps submitted during the port-a-thons (~35,000). 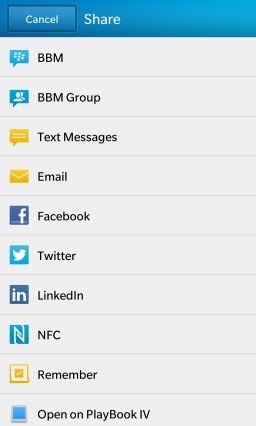 Finally it became available on BlackBerry World for both BlackBerry 10 and BlackBerry Playbook. And the Vendor Portal provides access to managing the ongoing app activity: charges, revisions, comments, etc. Bottom line: Generating a smartphone app from the content and RSS feed of a website provides one more access point to content on a website’s posts. 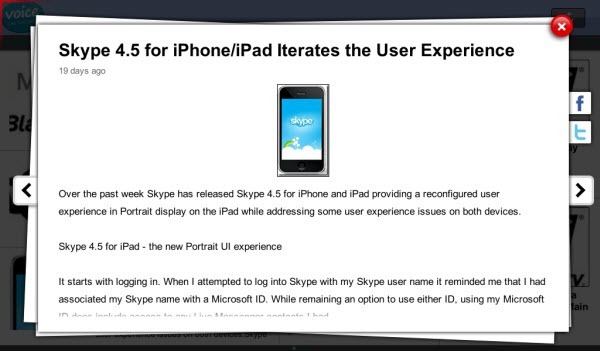 Costs were negligible, even in terms of time and, in this case, for the user, the app is free. On the other hand, bringing up a “responsive design” website directly in a smartphone’s browser retains the full integrity of the original website. 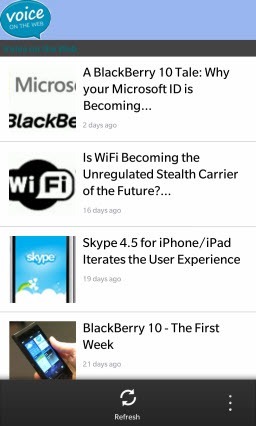 Menus and the associated navigation remain readily available; the sidebar, while moved below the main content page being viewed, is accessible simply by swiping downward. 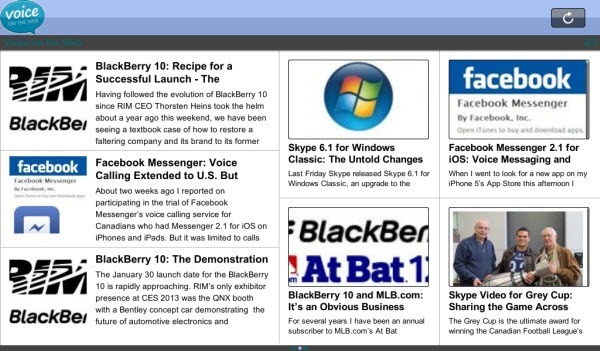 Via the menu you can access WordPress Pages in addition to Posts. All the options to “Share” a web page remain available. 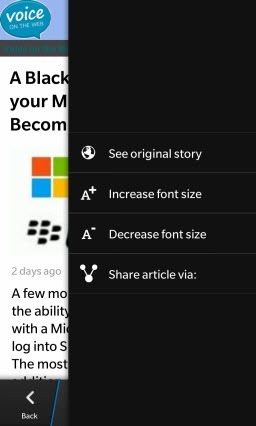 The BlackBerry 10 browser’s Reader mode display option, shown on the right, retains the actual formatting while providing a standardized, readily readable font with easy adjustment of font size. While larger images are reduced in size in the Reader mode, tapping on the image brings up the full size image (within the constraints of the actual display size).